What Are Your Favorite Horse Breeds? What are your favorite horse breeds? If you could choose only one, what would it be? I know...it is really hard to decide isn't it? This page is about favorite horse breeds. I'll keep adding more about different breeds, so be sure to tell me about yours! Did you know that American quarter horses are named after their ability to run a quarter mile faster than other horses? They are really popular full-sized horses with heavy physiques and great athletic ability, disposition and versatility. Because of their characteristics, these horses are popularly used for short distance racing. They were originally called "quarterpathers," then "colonial quarter of a mile running horses," (that's a mouthful!) and eventually "American Quarter horses." The Quarter horse breed was founded in the early 17th century and is a combination of English and Chickasaw horses (imported horses that were descendants of Arabia and Barb). Native Americans of Southeastern United States were the first people to domesticate this breed. In the 19th century, Spanish conquistadors used these horses as they went West. During this time the Quarter horse was crossed with other breeds such as Mustangs and other feral horses from the Comanche, Shoshoni and Nez Perce tribes. In addition to being fast and versatile, the American Quarter horse also has some notable physical and mental characteristics. The Quarter horse has a small, short and refined head, a strong well-muscled body, broad chest and powerful hindquarters. If you've ever ridden one of these horses, you understand what that means! They are usually 14 to 16 hands high. The color of their coats varies and range from bay, black, brown, chestnut, palomino, dun, red dun, blue dun, blue roan, cremello, white to grey. These horses are classified into 3 types: stock, halter and racing and hunter. Stock quarter horses are used for western pleasure shows. Halter quarter horses for halter competitions, and racing and hunter type horses are bred to sprint short distances. A lot of riders also believe American Quarter horses are really smart and willing to work! 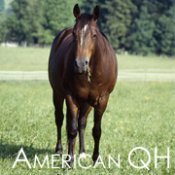 Today, there are more than 3 million Quarter horses registered in the American Quarter Horse Association (AQHA) worldwide. They are popular just as they have always been. In the United States, you will find them everywhere - in race tracks, ranches, show arenas, trails and backyards. Do you love quarter horses? Be sure to share your own pics of these gorgeous animals! I think Appaloosa horses are very pretty. No wonder they are a fave of horsecrazy girls! Known for their colorful and leopard spot-patterned coats, they are the most popular in the US. This breed has been around for a long time. Lots of ancient artwork show that these horses were originally domesticated in Ancient Greece, Persia and China. They were popularly used in parades, for riding, and as coach and horsemanship horses and were especially preferred by noble and royal families. During the 16th century, they were brought to the US by Spanish conquistadors and, from there, the breed spread from Mexico to California and Oregon. 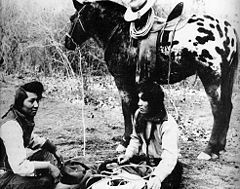 The Nez Perce were the first people to use and become very fond of Appaloosa horses in the US. They called them “Palouse Horses,” after the Palouse River that ran through the center of the Nez Perce country. The population of this beautiful breed declined when the Nez Perce lost many of their horses in the war of 1877. It was not until 1937 that the preservation of this breed was encouraged by Francis D. Haines. Aside from its patterned coat, the Appaloosa horse is known for other distinct physical characteristics – mottled skin or partly-colored skin, striped hooves and white sclera. They also have straight lean heads, wide foreheads, medium pointed ears, deep chests and long sloping shoulders. These horses are usually 14 to 16 hands high with an average weight of 950 to 1250 pounds. Coat colors range from bay, brown, black, dun, palomino, chestnut, gray, to bay, blue and red roan. 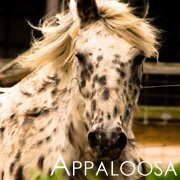 As mentioned earlier, the Appaloosa horse is the most popular breed in the US. In fact, these horses have been adopted by the state of Idaho in 1975 and are considered "official state horses." Appaloosa horses are widely used for Western and English riding today. In fact, you've probably seen them in early Western TV shows and movies. A few famous ones include Cojo Rojo (The Appaloosa, 1966) and Zip Cochise (El Dorado, 1966). You might want to ask your parents about these movies – they’re way before our time! But aside from Western and English riding, horses from this breed are also used for barrel racing, pole bending, fox hunting, show jumping, eventing, endurance and trail riding as well as for horse racing. Did you know that Arabian horses get their name from the name Kohl-ani? These beautiful creatures have bluish-black skin, like kohl. People in the East used kohl as makeup before Cleopatra. This breed is one of my favorites. They are the oldest breed of horse! They were bred by people called the Bedouins who live in the Middle East. Do you know what to look for in a horse to see if it is an Arabian? Well, it has large eyes, a neck that is arched, large nostrils, a dished head and her muzzle is so small that it can fit into a teacup. They need large nostrils because they are so energetic and need a lot of air for running. Her chest is deep so her lungs have plenty of room to expand when she is active. Arabian horses have really strong legs and they don’t have many problems with lameness. This breed holds her tail high in the air, making her look really proud. I like to watch Arabian horses in competition. They can do a lot of things! Since they are so fast, they are used for racing a lot. They can be used too as halter horses, trick horses, trail riding, reining, cutting, and just riding for fun. They are not as good for jumping since they are smaller than horses who jump well. They can do pretty much everything else well, except jumping. They are very athletic and strong, so they do well in dressage competitions. You might be wondering if this breed is the right one for you. Well, here is what I like the most about them. They are sweet, beautiful, very loyal and loving, and have graceful gaits, so they are easy to ride. They are really fast too! So, if you like to ride slow and fast, this is a good choice for you. You could compete in a lot of different activities since they can be trained to do several things. I have also read that they will be your friend for life! Here are some interesting things I learned about Arabian horses. Did you know that the first one owned by someone in the United States was owned by our first president, George Washington? The singer Jewel owns an Arabian horse named Chance. She has been riding horses for most of her life. This is a neat fact about Arabian horses: they have one less rib than other horses, so they have 17 instead of 18. Also, other horses have 18 vertebra in their tails, but they have only 16. This breed comes in all different colors. They can be chestnut, bay, black or gray. Some even have what is called sabino pinto markings that look like white spots. They are pretty tall at 14.2 to 15hh. This breed of horse is special because they can go for long trail rides. What girl doesn’t like to do that with her horse? 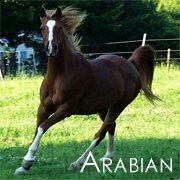 Arabians are very smart and have a great attitude toward people. When they trot, they look like they are floating on air! They are very energetic, but gentle too. Chincoteague and Assateague ponies come from an island off the coast of Virginia. According to legend, long ago a Spanish galleon got shipwrecked during a storm off the coast of Assateague Island. The ponies escaped and swam ashore. The truth isn't half as interesting. Colonists living in Virginia probably turned horses loose on the island. It doesn't matter how they got on the island, really. Today they are a wonderful American pony breed. They are well-known for flashy colors, lots of personality and intelligence. The ponies on Assateague Island are actually divided into two different herds. The Virginia herd is in the south. These are the ponies known as Chincoteague ponies. The northern herd are called Assateague ponies. Both Chincoteague and Assateague ponies are taken care of by the National Park Service. Every year on the last Monday in July, the Saltwater Cowboys round up all the wild ponies. On Wednesday, the ponies swim across the channel for Pony Penning Day. Hundreds of people line the shores to watch the ponies swim. It takes them five to ten minutes to swim across. It is amazing that even the small foals can make the swim safely! The wet ponies are then paraded to the carnival grounds. The ponies rest and those who will be in the auction the next day are tagged. At the auction on Thursday, the foals are sold to people who have come from all over the country. The money raised from the auction helps the Chincoteague Volunteer Fire Department. While it may seem sad to sell the foals, it keeps the herd on Assateague to around 150 ponies. This is an amount the island can support in good health. The foals that are sold get to go to loving homes with the lucky people who bought them. On Friday, the older ponies are returned to Assateague for another year. The wild ponies are checked twice a year to see if they are healthy. They have their hooves trimmed, they get shots to prevent contagious diseases and they get wormed. Pony Penning Day used to be the only place you could get a Chincoteague pony. Now there are small herds of these rare ponies being raised in other parts of the country. Now it's easier for those of us who are crazy about Chincoteague ponies to get one of our own! Chincoteague ponies are on the large side for a pony. They can range from 12 hands to 13 hands high. A full grown pony can easily carry a person up to 150 pounds. 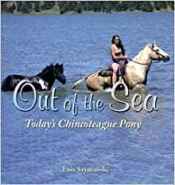 The most famous Chincoteague pony was Misty. 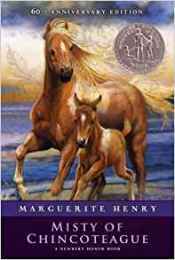 She was made famous by the book "Misty of Chincoteague" by Marguerite Henry. The book was written in 1947, and remains a favorite of children everywhere. Like almost every other girl who read Misty's story, I've always wanted to go to Pony Penning Day to get a pony. Misty even had a movie made about her in 1961. She toured schools around the world for awhile. Misty then retired back to Chincoteague to have babies of her own. Misty died on October 16, 1972. If you're lucky enough to visit Chincoteague, you can see her hoof prints in the cement in downtown Chincoteague. She has a statue honoring her as Chincoteague's most famous pony, too. Chincoteague ponies have their own registry now, like other horse breeds. It began in 1994. It is known as the Chincoteague Pony Association. Since Chincoteague ponies were bred by natural selection, there is quite a range of characteristics. Some ponies look more like Arabians, while others look like small Mustangs. Their heads should be expressive, with a wide forehead. Their eyes should be large and soft. Their nose should be short, and can be either dished or straight. It should end in a firm, tapered muzzle. They weigh about 750 pounds and you can find them in almost any color. Pintos are very common. The Chincoteague ponies are smart. They do well in horse shows. They learn quickly and are fun to ride. They can be a wonderful breed to add to your stable. 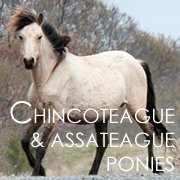 And even if you can't own one, you can help support them by becoming a member of the Chincoteague Pony Association. I love Chincoteague and Assateague ponies!! Don't you? 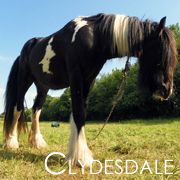 If you are looking for a big beautiful horse, then the Clydesdale is for you! These draft horses came from the farm horses of Clydesdale, Scotland, which is where they get their name. I was very surprised to learn they were originally one of the smaller breeds of draft horses (!) because every one that I have seen is really large. The horses for the Budweiser team are born at Warm Springs Ranch in Boonville MO and you can tour the ranch if you are out that way. (It’s on my list next time I visit my cousins in Missouri.) Each horse that makes the show team must be at least 18 hands high. You’ll usually see Clydesdales are that are bay but they can also come in black, grey, roan or chestnut. And most of them will have white markings on their face, feet or legs - even on their body every once in awhile. The Budweiser team horse all have black manes and tails. If you think that a Clydesdales may be slow because of their size, guess again. They really do need a lot of action and exercise. And talk about a big appetite; the folks at Warm Springs Ranch say these horses can eat up to 50 pounds of hay plus 20 - 25 pounds of grain, vitamins and minerals every single day! As you’d guess, these horses are not afraid of work and they have been used by farmers in the fields and for hauling coal and other heavy loads. Now many people keep them for pleasure riding and even shows. If you are looking for an intelligent and gorgeous horse, and you are able to care for a horse that will need lots of hay, grain and grass to keep it well fed then you may want to learn more about this breed. One place to find out more is through the Clydesdale Horse Society which has over seven hundred members. Many of them breed this type of horse. 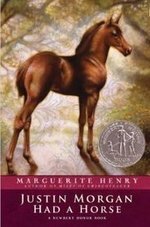 Have you ever read the novel Justin Morgan Had a Horse by Marguerite Henry? Or watched the movie? (Both are good – I recommend them!) If you have, then you might’ve already learned a little about the magnificent Morgan horse breed. I rode a really fun Morgan horse, Rikki, for a while and really liked him so I think the breed is pretty cool. Here are some more things you might want to know about the Morgan horse breed. 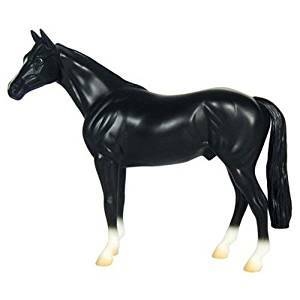 Did you know that Morgan horse is the first known American horse breed? These horses trace back to one foundation sire – Figure, who was owned by a horseman named Justin Morgan in 1788. Figure was one of two colts who were taken as payment for a debt. He looked like just a little thing at first but he grew to be 14 hands high and weighed 950 pounds. He turned out to be a strong bay horse that worked the fields, had a certain distinctive look, conformation, and temperament. These are all characteristics that Morgan horses have today. Figure spent a life working on farms and as a parade mount at militia trainings. He died at the age of 32 in 1821 and was buried in Tunbridge, Vermont. He’s the horse who is the star of the book and movie, Justin Morgan Had a Horse. One thing I loved about his story was that no one thought he could do what he did because of his size, but he ended up winning all kinds of competitions! You may be able to tell a Morgan horse if you know what to look for. You’ll probably see a compact, refined build; large expressive eyes; an upright, graceful neck, strong limbs and laid back shoulders. These horses are usually black, bay and chestnut. But you may see them in other color patterns like grey, dun, palomino, roan, or even pinto patterns! 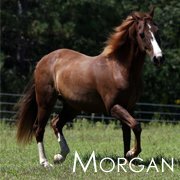 Most full grown Morgan horses will be between 14.1 to 15.2 hands high. If they are under 14.1 hands tall, then they will be considered “ponies” and registered with the National Morgan Pony Registry (even though they are technically full-grown horses). Morgan horses are usually athletes. They can be ridden Western or English, and they often make great trail horses and ranch horses. You may see this breed in horse shows – even in the Olympics! There is even a show circuit just dedicated to this breed. You may have also seen them in show jumping, dressage, eventing or combined driving. Famous Morgan horses include Figure, of course, as well as Little Sorrel, who Confederate General Stonewall Jackson rodeduring the Civil War and Charlemagne, mounted by General Joshua Chamberlain in the Battle of Gettysburg in 1863. In the US, horses of this breed are registered with the AMHA or the American Morgan Horse Association. Don’t you love mustang horses? They look so beautiful, running wild and free. They are one of the many equine breeds that roam the lands of North America. Originally, the mustang breed was a native of Spain. They were brought here when the Spaniards colonized America. Did you know Mustang horses aren’t really wild? They are known as “feral horses,” which means they are domesticated but run freely in the wild. When the Spaniards left America, many of them were left in North American lands to thrive and breed in the wild. Like all other horse breeds, mustang horses come in lots of different colors such as coyote duns, blue and red roans, flea-bitten grays, shiny blacks, rusty browns, sorrel and many more. They have also been crossed with other breeds such as the East Friesian, Thoroughbreds and more. Mustang horses are medium in size, usually about 13 to 15 hands high. They have short backs and smooth muscles. They have a powerful build and a good personality. Compared to other breeds of horses, they are fast and are known for their endurance. In the past, many mustang horses roamed freely in the wild. But cattle-owners saw them as competition for grazing space so they were rounded up, captured and killed. Back in those days, they were not protected by the law so many cattle-owners did as they pleased with them. It was horrible. Many were shot and brought to the slaughter house for dog food. During those hard times, these beautiful animals found their champion in a woman named Velma Bronn Johnston. Growing up, she spent most of her time with horses. Her passion and love for these gentle giants is what led her to fight for their safety and their right to live. 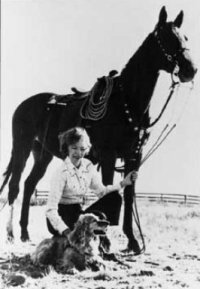 Velma Bronn Johnston is better known today as “Wild Horse Annie.” In 1950, she saw a truck dripping with blood and full of horses. She followed it and realized they were being brought to the slaughterhouse. After seeing this, she began a campaign to save wild horses from maltreatment and death. She investigated further and enlisted the help of ranchers, politicians and businessmen, as well as schools to make her research public. Her efforts first paid off when her campaign encouraged Nevada State Senator James Slattery to pass a bill that made mustang roundups on private property by plane and cars illegal. But Wild Horse Annie didn’t stop there. She continued her campaign to achieve better protection for the mustangs. In 1971, her campaign finally achieved its goal. The 92nd United States Congress passed the Wild Free-Roaming Horses and Burros Act which forbade the disturbance, capture, injury and transfer of wild horses and burros even when populations are too large. 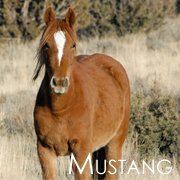 Although the 1971 act has been amended twice to address concerns of overpopulation, the mustangs and other wild horses are now free to roam and live safely – thanks to Wild Horse Annie and her animal rights campaign. They Still Need Your Help! The fight to save these gorgeous horses is not over! There are still wild horse round ups going on, and some horses have died from them. The Wild Horse Preservation Campaign is helping to save mustang horses. This is really important so be sure to visit their website and get involved! Palomino horses, also known as golden horses with ivory manes and tails, are one of the most awesome horse breeds of all time. 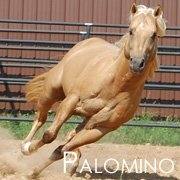 But did you know that the term “palomino” is actually a surname and only refers to a horse’s coat color, not its true breed? 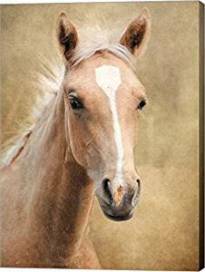 Yes, palomino horses are registered as a color breed and are actually a group of horses with different breeds but with almost the same colors. When is a Horse a Palomino? Horses that are accepted as palominos usually have a yellow, cream or gold to dark gold coat and a white or cream-colored mane and tail. They are usually born with pinkish skin that darkens with age and have amber or brown eyes. They are also usually 14 to 17 hands high. A palomino’s coat color changes its shade in the summer and in winter. During summer, a palomino’s coat is usually dark in color and naturally becomes lighter in the winter. But aside from their distinctive color characteristics, palominos are also known to be multi-purpose horses. They are not only beautiful but are versatile, easy to handle and have great stamina. For these reasons, they are typically the first choice for parades, fiestas, shows, rodeos, ranching, trail rides, jumping and other horse-related activities. Where did Palominos come from? Horse experts believe that they were once royal horses from Spain and were very much loved by Queen Isabella. During this time, commoners were not even allowed to own such horses! These beautiful animals were only introduced to the United States when the Queen sent some of her beloved palominos to her Viceroy as they settled in New Spain which is now New Mexico. From there, the breed spread into Texas and throughout California. 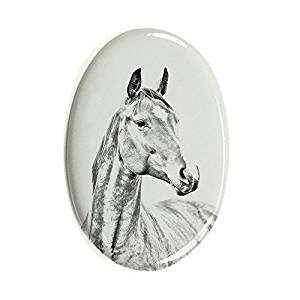 Today, the palomino group consists of different horse breeds such as the American Saddlebred, the Quarter Horse, the Morgan Horse, the Tennessee Walking Horse, Arabians, Haflingers, Thoroughbreds, Paints and more. They can be registered with the Palomino Horse Association (PHA) or the Palomino Horse Breeders of America (PHBA). Aren’t Shetland ponies the cutest? As their name implies, this breed came from the Shetland Isles which is located north of Scotland. They are known for their strong build and are often used for riding, driving and packing. But despite their sturdy build, these adorable ponies are a fave of horsecrazy girls because of their size – they are one of the smallest horses in the world! They are usually 28 to 42 inches or 7 to 10.5 hands high (although this breed isn’t measured by hands). Even though Shetland ponies are originally from Scotland, they came to the United States through Eli Elliot in 1885. This breed is a cross between original ponies from Scotland and other breeds. Today, there are 2 basic types of American Shetland ponies – Classic and Modern. Classic American Shetlands are more refined than their original (Scottish) counterparts. They are known for their gentle and well-balanced disposition. A lot of people think they are perfect for shows, trail riding and parades or even as pets as they are low maintenance. Foundation Shetlands are also grouped under the classic category. But they are more conservative and are bony. 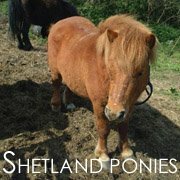 Modern American Shetlands are crossed with the Hackney pony and are known for their attractive appearance. These ponies are agile, quick-thinkers and have a lot of natural motion. The Modern category is broken in two types – Modern and Modern Pleasure. Modern ponies look a little bit like the Classic ones but are extreme in motion, while Modern Pleasure ponies display a more agreeable attitude and are generally weaker. Modern Pleasure ponies only use light pads and cannot use weighted shoes. Don't you just love these adorable ponies? 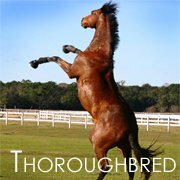 If you’re looking for horses that are fast and pretty, then thoroughbred horses are for you! These horses are known for their agility, speed and spirit. Although they are mainly used for racing, this breed is also used for show jumping, dressage and polo, combined training and fox hunting. Thoroughbreds are also known as “hot-blooded” horses. Thoroughbred horses are originally from England. During the 17th century, native mares were crossbred with imported stallions such as the Turkoman, Arabian and Barb – all from the Middle East. In 1730, thoroughbred horses were brought to North and South America, Australia, Europe and Japan – which is why this breed is now found anywhere in the world. A Thoroughbred horse is usually 15.2 to 17 hands high. Most of these horses are bay, chestnut and black, gray and seal brown. Some of them are roan, palomino and even white (rare). Thoroughbreds are known to have a chiseled head, long neck, short back, deep chest, long legs and a lean body. A few have white markings on their face and legs. Horses of this breed are known for their maximum performance. This characteristic is what makes Thoroughbred horses best for racing, but it is also the reason for high accident rates and health problems some have. The first Thoroughbred horse to arrive in the United States was Bulle Rock, imported by Samuel Gist of Virginia in 1730, followed by Diomed (1780) and Messenger (1788). Diomed is known for winning the Derby Stakes in 1780. Other famous ones include Barbaro (2006 Kentucky Derby Champion), Ruffian (the greatest female racehorse), Seabiscuit (the Best Horse in America) and Secretariat (first US Triple Crown Champion) are famous for winning numerous races in recent years. In North America, 37,000 Thoroughbred foals are registered each year. Most of these foals come from the states of Florida, Kentucky and California. Because of their great characteristics and racing abilities, Thoroughbreds are known to be expensive horses. Prices all over the world vary and range from thousands to millions of dollars depending on factors such as age, pedigree and conformation. In the US, one of these horses may cost $2,500 to $500,000. From Amazon: Based on the inspiring true story of three men - a jockey, a trainer and a businessman - and the undersized racehorse who took the entire nation on the ride of a lifetime. 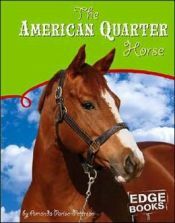 From Amazon: Ben Crane, a horse trainer whose career is spiraling downwards, goes to work for a wealthy breeder. But when a promising young filly breaks her leg and he's ordered to put her down, Ben refuses. Instead he takes the much-loved horse Sonador with him and he and his daughter set out to beat the odds and make her race worthy again. I absolutely love warmblood horses. I like the fact that they are robust in their build. They tend to be tall in stature, and I like that as well. I also like the fact that they have some “get up and go,” but they don’t tend to be hot. This is a breed of horse I would love to own someday! Warmbloods originally are from Europe. It turns out that when warriors came back to Europe from the Middle East and Africa with the more hot-blooded Arabian horses that they captured in battle, they would breed their larger heavier war horses with the lighter, faster and fiery tempered hotbloods from the Mongolian steppes. The results, in my opinion, were magic! Together these breeds created agile, quick horses with wonderful temperaments and that sturdy build I love. Out of all this breeding came some other amazing breeds like the the Hanoverian, the Holsteiner, the Westphalian, the Oldenburg and the Trakehner. I’ve ridden my trainer’s Trakehner and while she can be a little hot, she’s a sweet horse and a true athlete. Warmbloods may have a stocky build but their heads and bodies are smaller than drafts. They’re usually not as excitable as hot-blooded horses, which makes them generally popular as all-round riding horses and even for light work. Years ago, warmbloods were bred so they could work on farms. But when horses were no longer needed to do that work (since farm machinery was invented), breeders started trying to breed horses that would be large and beautiful with great movement and temperaments. 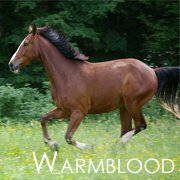 Warmbloods are very popular competition horses. You’ve probably seen them at horse shows, and many times they are in the ribbons! They are popular in Olympic sporting events such as jumping and dressage. You may have seen Hanoverians in particular in eventing. Did you know what some of the American breeds like the Quarter horse, Tennessee Walking horse and Palomino all originally came from Arabians being bred with draft horses? I would really love to ride a Warmblood. How about you? I’ve told my parents they are great horses and just hope we find one when I finally get my horse. Here’s the tough part. Warmblood horses can be one of the most expensive types of horses you can buy. Some well-trained, well-bred ones can sell for hundreds of thousands of dollars. Sometimes even young ones sell for lots of money when they come from a good bloodline and have great potential. Why do they cost so much? One reason is that they aren’t usually ridden until age four or five - and you have to feed and care for them until then. (It’s not inexpensive to do that!) Also, because they can be valuable they may be kept somewhat isolated from other horses. To develop a truly great warmblood can take years of training and care, and that all adds up. Ever wonder why you hear so many different names for warmbloods, like Dutch or Swedish or Danish? That’s because they are named for the countries where they are bred and their studbooks are kept. The Dutch warmblood horse - or really any kind of warmblood horse - are a popular breed for dressage and show jumping in the highest level. They fall under the category of competitive and recreational horse, but I'd just call them gorgeous. Wouldn't you? Dutch Warmblood horses were first bred in the 1960s before World War II. This breed evolved from two native Dutch horses – the Gelderlander and the Groningen. Gerlderlander horses from central Holland were stylish, of medium stature, and often chestnut with white markings. On the other hand, Groningen horses from the north were larger, heavier and most often black in color. So you can see how these two horse breeds came together to make the horses you see today! Dutch Warmblood horses now are usually long-legged (good for jumping! ), attractive and have a rectangular frame. Their colors are mostly brown, black, chestnut, bay or grey, and white markings are very common. They are sensitive and cooperative which is why they were ranked #1 in jumping by the World Breeding Federation for Sport Horses (WBFHS) in 2010. And there's more… a Dutch Warmblood was part of the very successful Lord of the Rings trilogy! Dutch warmbloods are well known, but there are also American warmbloods. Similar to their Dutch counterpart, American warmblood horses are primarily involved in dressage, show jumping, eventing and driving. 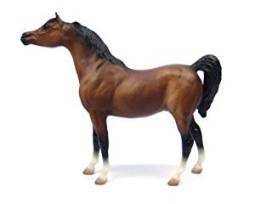 They evolved from Thoroughbreds (hot-blooded horses) and Draft horses (cold-blooded) and are known to be more distinct. They usually stand 15 to 17 hands high, have solid colors with a willing yet calm personality. If you have been to a top-rated show you've probably seen one of these horses. They are often in the winner's circle! In the US, there are two registries that recognize this breed – the American Warmblood Society and the American Warmblood Registry. And there's more! There are German Warmblood horses too. These horses originated from Germany but are not exactly considered as a breed as they are often bred with other warmbloods, Anglo-Arabians, Thoroughbreds and Arabians. 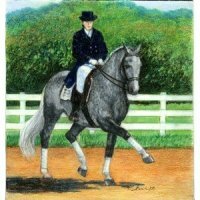 The German Warmblood horses are recognized by the German Horse Breeding Society. KWPN - The KWPN is one of the largest Warmblood studbooks in the world and has consistently placed at the top of the world rankings for jumping and dressage. KWPN-NA - The Dutch Warmblood Studbook in North America was established as the North American Department of the Royal Warmblood Studbook of the Netherlands (KWPN) in order to promote breeding and enjoyment of the KWPN horse in North America. Take my poll, tell me about your favorite horse breeds, then come back to see your review and learn more! 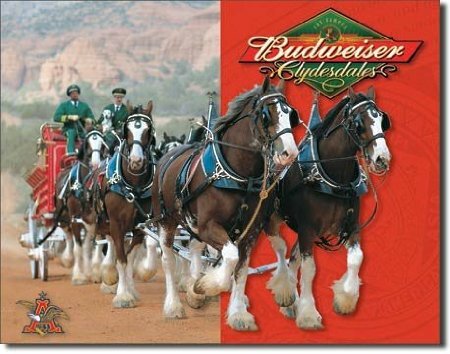 Clydesdale: Famous in the United States as the "Budweiser" horse. Very strong, large and sound. Friesan: Known for its beautiful trot and good personality. Icelandic: Purest breed, tough, great swimmers and climbers.